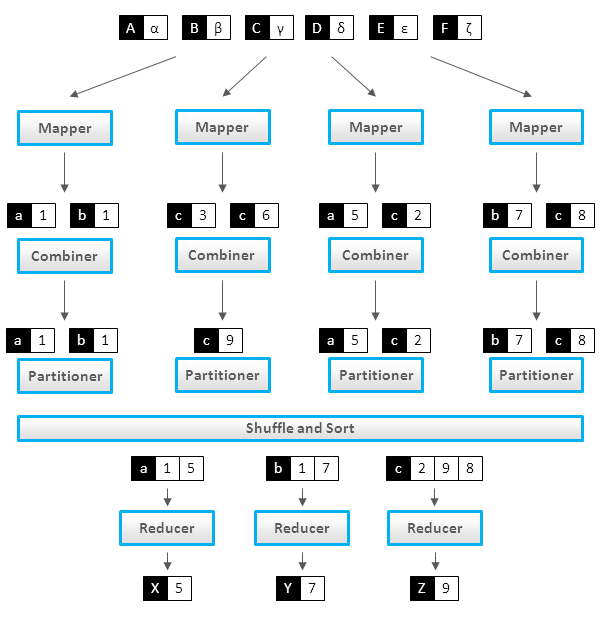 Hadoop MapReduce jobs are divided into a set of map tasks and reduce tasks that run in a distributed fashion on a cluster of computers. Each task work on a small subset of the data it has been assigned so that the load is spread across the cluster. The input to a MapReduce job is a set of files in the data store that are spread out over the HDFS. In Hadoop, these files are split with an input format, which defines how to separate a files into input split. You can assume that input split is a byte-oriented view of a chunk of the files to be loaded by a map task. The map task generally performs loading, parsing, transformation and filtering operations, whereas reduce task is responsible for grouping and aggregating the data produced by map tasks to generate final output. This is the way a wide range of problems can be solved with such a straightforward paradigm, from simple numerical aggregation to complex join operations and cartesian products. Each map task in Hadoop is broken into following phases: record reader, mapper, combiner, partitioner. The output of map phase, called intermediate key and values are sent to the reducers. The reduce tasks are broken into following phases: shuffle, sort, reducer and output format. The map tasks are assigned by Hadoop framework to those DataNodes where the actual data to be processed resides. This ensures that the data typically doesn’t have to move over the network to save the network bandwidth and data is computed on the local machine itself so called map task is data local. The record reader translates an input split generated by input format into records. The purpose of record reader is to parse the data into record but doesn’t parse the record itself. It passes the data to the mapper in form of key/value pair. Usually the key in this context is positional information and the value is a chunk of data that composes a record. In our future articles we will discuss more about NLineInputFormat and custom record readers. Map function is the heart of mapper task, which is executed on each key/value pair from the record reader to produce zero or more key/value pair, called intermediate pairs. The decision of what is key/value pair depends on what the MapReduce job is accomplishing. The data is grouped on key and the value is the information pertinent to the analysis in the reducer. Its an optional component but highly useful and provides extreme performance gain of MapReduce job without any downside. Combiner is not applicable to all the MapReduce algorithms but where ever it can be applied it is always recommended to use. It takes the intermediate keys from the mapper and applies a user-provided method to aggregate values in a small scope of that one mapper. e.g sending (hadoop, 3) requires fewer bytes than sending (hadoop, 1) three times over the network. We will cover combiner in much more depth in our future articles. The partitioner takes the intermediate key/value pairs from mapper and split them into shards, one shard per reducer. This randomly distributes the keyspace evenly over the reducer, but still ensures that keys with the same value in different mappers end up at the same reducer. The partitioned data is written to the local filesystem for each map task and waits to be pulled by its respective reducer. The reduce task start with the shuffle and sort step. This step takes the output files written by all of the partitioners and downloads them to the local machine in which the reducer is running. These individual data pipes are then sorted by keys into one larger data list. The purpose of this sort is to group equivalent keys together so that their values can be iterated over easily in the reduce task. The reducer takes the grouped data as input and runs a reduce function once per key grouping. The function is passed the key and an iterator over all the values associated with that key. A wide range of processing can happen in this function, the data can be aggregated, filtered, and combined in a number of ways. Once it is done, it sends zero or more key/value pair to the final step, the output format. The output format translate the final key/value pair from the reduce function and writes it out to a file by a record writer. By default, it will separate the key and value with a tab and separate record with a new line character. We will discuss in our future articles about how to write your own customized output format.